Today was Day #2 of Chocolate and Music/Audio Theme Week. There are many ways to define this week's theme. While one can make musical instruments from chocolate (molded items, chocsimiles of musical instruments), this week I'm also focusing on audio or music inspired by chocolate and/or the tasting arc of a given chocolate. 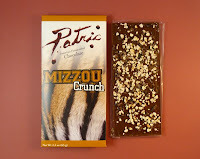 The Mizzou Crunch bar from Patric Chocolate (Columbia, MO) combined a high-quality dark milk chocolate bar base with crunchy chopped peanuts, cacao nibs, and a touch of salt. Throughout the tasting arc, these flavors formed a well balanced and interesting and satisfying blend. 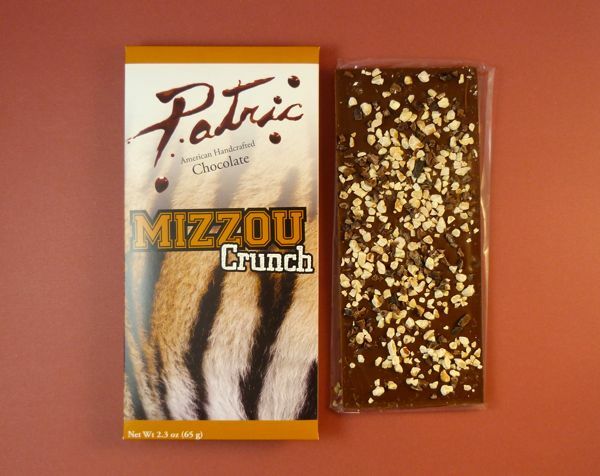 This bar was a tribute to the University of Missouri, thus the black and gold colors and tiger stripes on the packaging. I could almost hear the school song ("Old Missouri") playing as I ate this bar. Go Tigers go!